2 Political Junkies: More On Daryl Metcalfe - He's Fighting For The Freedom To Gerrymander! More On Daryl Metcalfe - He's Fighting For The Freedom To Gerrymander! State Rep. Daryl Metcalfe, R-Cranberry, led an effort Wednesday to gut a bill that would have created an independent commission of citizens to draw electoral maps instead of leaving the process to legislators. Metcalfe, chairman of the House State Government Committee, called a surprise morning meeting and introduced an amendment to the proposal that completely changed what the legislation would do. Talk about a blatant power grab by the Republicans in the Pennsylvania State House. At 10:30 a.m. Wednesday, without prior notice of what was going to be voted upon by House State Government Committee, state Rep. Daryl Metcalf, the committee chairman, handed out an amendment to House Bill 722. There were no discussion, no hearings and no testimony by the sponsors of HB 722. It was passed on a strict party-line vote. Wanna talk legislative transparency? We'll start here. So what does this Metcalfian-fiasco do? Under current law, the state’s mapmaking commission consists of five members. The Legislature picks four and the Supreme Court one. The governor has veto authority over the congressional map, not the state legislative map. Either map could be appealed to the state courts. But then the State Supreme Court ruled the current set of Congressional districts unconstitutional because it unfairly favored the GOP. Four of the members would come from the state’s largest political party, which current voter registration records show is Democratic. Another four would come from the party with the second highest number of registered voters, Republicans. The remaining three members would come from minor parties. Adding that no one on the commission "could not be related to any statewide or congressional official or lobbyist." Of those who qualify, a random sampling of 40 names is made. The legislature's top caucus officials could veto up to 6 names each. Sounds like a good idea. No one is beholden to the current unbalanced process. The legislative districts would be fair(er). 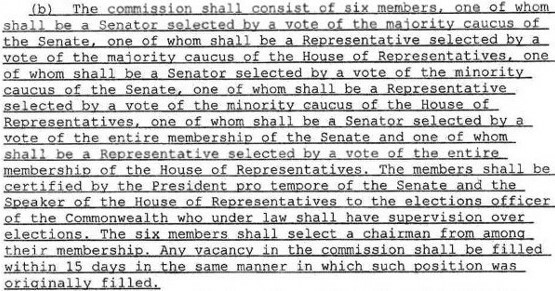 You'll note that instead of 11 people unconnected to "any statewide or congressional official or lobbyist" the commission will be made up of already elected Senators and House Representatives chosen in such a way as to unerringly favor a party that controls both houses (and in this case by a complete and utter coincidence, of course, that just happens to be Metcalfe's GOP). And if the committee can't agree on a map then the whole Assembly votes on the draft. And who controls both houses at this time? What a coincidence: Again, it's Metcalfe's GOP! With no discussion, hearings or input from the authors of the original legislation, it passed by on a party-line vote (meaning Metcalfe's GOP). And this is considered "neutral" to Daryl Metcalfe - and something not at all a tyrannical subversion of the process to favor some "partisan agenda." “The amended House Bill 722 would ensure that neutral, locally focused criteria would remain the only standard by which a map could be judged, preventing any activist Supreme court from tyrannically subverting these criteria to its own preferred partisan agenda,” Metcalfe said in a statement.